All Liverymen and Freemen are expected to attend the annual Election Court General and this year it will be held on HQS Wellington at 5.00 p.m. This annual event is the occasion where our new Master and Wardens are elected for the ensuing year so it’s important members take part. It will also include admission to the Livery of those qualified Freemen who indicate their intention. While the Election takes place, guests are invited for a tour of HQS Wellington. Following the Election there will be a drinks reception and 3-course supper for members and guests on HQS Wellington from 6.15pm. The principal guest and speaker will be Sheriff The Hon. Elizabeth Green. Supper on the HQS Wellington is a new experience in our social calendar. In the past our Court Election was followed by a church service in the Chapel Royal of St Peter ad Vincula, Tower of London. For the first time this year, we are introducing a different format. Liverymen and Freemen are encouraged to bring guests to the unique and historic venue of HQS Wellington, the floating Livery Hall of the Honorable Company of Master Mariners. Built at Devonport Dockyard in 1934, Wellington is the last surviving member of the Grimsby class of sloops, 1 of 13 Grimsby class warships built for service in the Commonwealth and Dependencies. During 6 years of war-time service she rescued over 450 Merchant Navy seamen and was active at Dunkirk and the North African landings. She also shared the credit for sinking a U-boat. 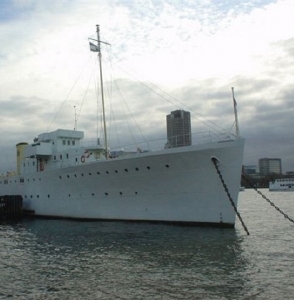 Shortly after the end of the war she was retired and laid up at Pembroke Dock. In 1947 HMS Wellington was made available by the Admiralty and purchased by the Master Mariners’ Company. She arrived, as HQS Wellington, at Victoria Embankment in 1948. Ownership was transferred in 2005 to the Wellington Trust, a charitable trust established to ensure the preservation of this historic ship. This event is open to Liverymen, Freemen & Guests. Dress code: Lounge suits and ties.